Here comes New York Fashion Week, again. Everything is about to change—or so it seems—as designers present fashion shows featuring clothes generally intended to break the rules. But one thing rarely, if ever, seems to change, and that’s the absence of black designers occupying top spots in the fashion industry. Freelance designer and journalist Kibwe Chase-Marshall recently published an op-ed in Business of Fashion—one of the most respected media outlets for fashion-industry reporting—titled, “Why Aren’t There More Black Designers?” It’s a question I’ve asked myself nearly every time I’ve gone into work over my 30-year career in fashion. Why? All too often, I’m the only person of color on set doing any job. The rare exception is on the catwalk, where the sheer number of people required to produce a fashion show calls for hiring more than one black person, simply by default. But when the final bow is taken, it is almost never a black designer who has the chance to receive either kudos or a career-ending critique from the press. Chase-Marshall—who worked in high-level but never top-tier jobs, such as vice president or head designer, for firms like Michael Kors, Isaac Mizrahi and Oscar de la Renta—found himself repeatedly slamming up against a glass ceiling. And now he’s breaking that glass ceiling by breaking the silence. Himself a talented technical draftsman, stylist and cutter, Chase-Marshall is not content to simply illustrate the talent of black designers as a solution to the problem. In February, I was on a steering committee for the Black Designers Exhibition and Symposium at the Museum at the Fashion Institute of Technology, which shed light on the fierce beauty of too-little-seen talent and started the conversation as to why—but did not offer us a plan to advance the battle. Chase-Marshall, who stopped working full time in design studios in 2010 after 13 years, now makes a living as a freelance designer and writer for publications like Elle. He has devised a plan of action for the Council of Fashion Designers of America and Vogue, which collaborate on the CFDA/Vogue Fashion Fund, the most powerful entity in the American—if not global—luxury-garment industry, which has promoted some of the most successful black designers in recent memory, such as Tracy Reese and Cushnie and Ochs. 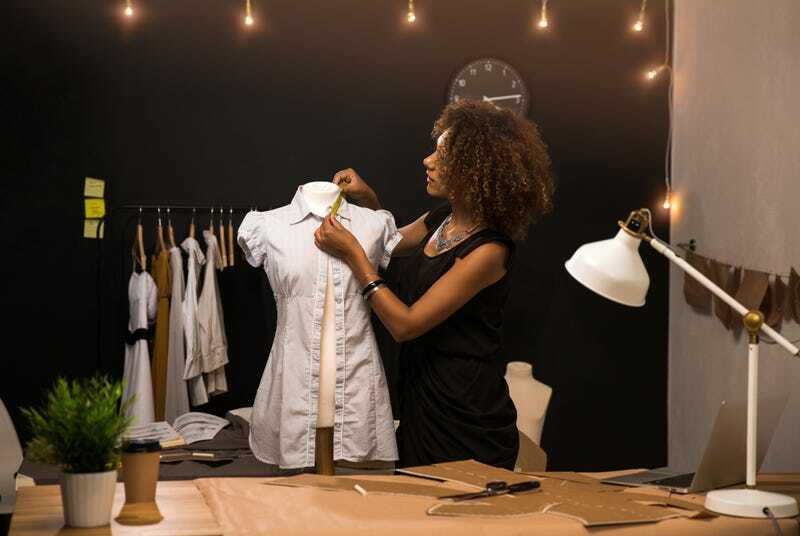 Chase-Marshall would like to see CFDA/Vogue adopt a program with greater oversight of its design-industry members, such as offering immersive training for hiring managers in elimination of bias, along with CFDA/Vogue’s annual disclosure and endorsement of participating brands, along with annual statistics regarding the racial composition of their design teams. Let’s do something: If you agree that it’s time for the community of fashion design professionals to be taken to task regarding employment/advancement discrimination against qualified black candidates, along with liking this post, comment #breaksilencebreakceilings and tag @CFDA, @Voguemagazine, @Bof, @nytimes, and @wwd below. In addition, forward this post to 5 friends (or more) that you feel care to affect overdue change. “Blackness, until very recently, was seen as an unmarketable quality,” says Chase-Marshall, who hails from Trinidad, was raised in Washington, D.C., and was a classmate of the Clinton and Gore children. But despite having the clubby connections to wealth and power that headhunters prize for their potential to move the needle when it comes to selling expensive designer clothing, he was discounted, simply because of the color of his skin. “I don’t care if someone is racist,” Chase-Marshall says. “I care if people use discriminatory hiring practices.” His is neither a call for affirmative action nor a call for quotas—which can undercut recognition of real talent—but, rather, a call for education transparency and accountability that can create lasting change within the fashion industry. Personally, I’m proud of Chase-Marshall for pushing us beyond merely saying that we have the right to more than just exist and be seen in the fashion industry. It’s our responsibility to demand, not only of fashion but also of our trendsetting selves, that our spending be reflected in the identities of the images marketed to us, as well as that our dollars come back into our communities through the black talent being paid and promoted according to their true worth. Inspired by Muhammad Ali and Colin Kaepernick, Chase-Marshall, who currently engages in every type of freelance work, from designing pull-up diapers to diamond rings, wants to be the kind of person who “prioritizes their integrity over their paycheck.” He broke his silence “because you can’t continue to play a losing game.” Now it’s time for the powerful consumers black women are to suit up and make the fashion industry play ball.